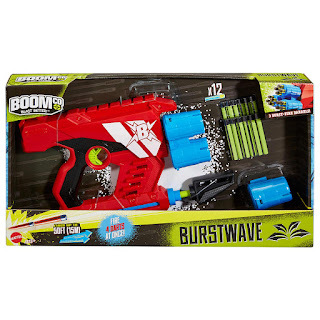 One of the new BoomCo blasters that has been out for a few weeks, the Burstwave, is a ToysRUs exclusive. Available for $25, it's a tad pricey. However, it performs its function very effectively, and has serious modding potential. 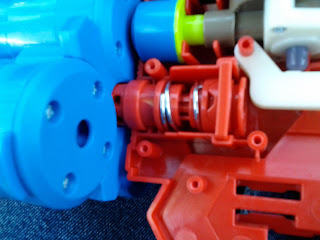 Inside the shell, we see the tank is roughly the same volume as the SM1500, but the internal layout is somewhat different. 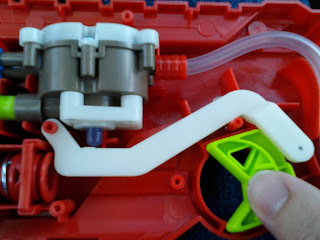 The tank has a push-button trigger, activated by a lever. 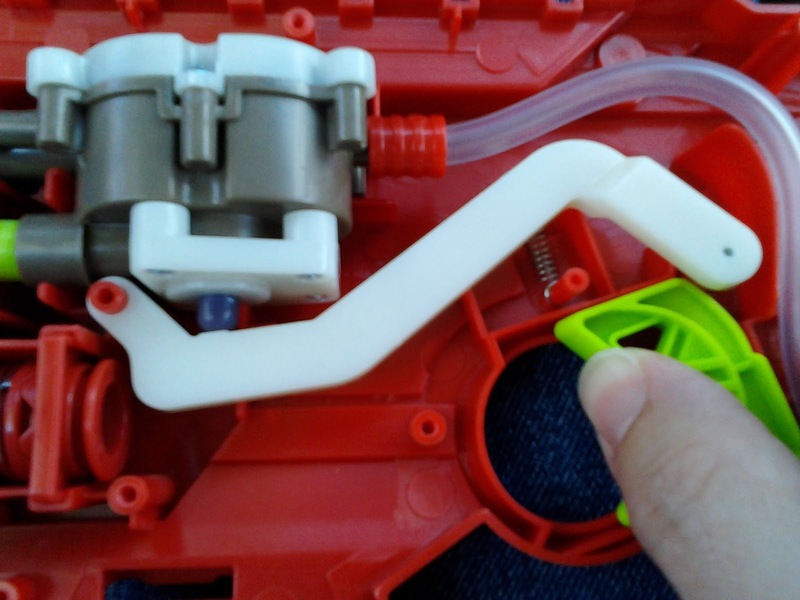 In addition, the OPRV is on the tank, instead of within the pump. Looking at the turret rotation gears, you can see there's a thick spring there. The turret won't move unless you want it to. This tab is the extra bit that helps keep the turret in place, as well as hold it against the air outlet. 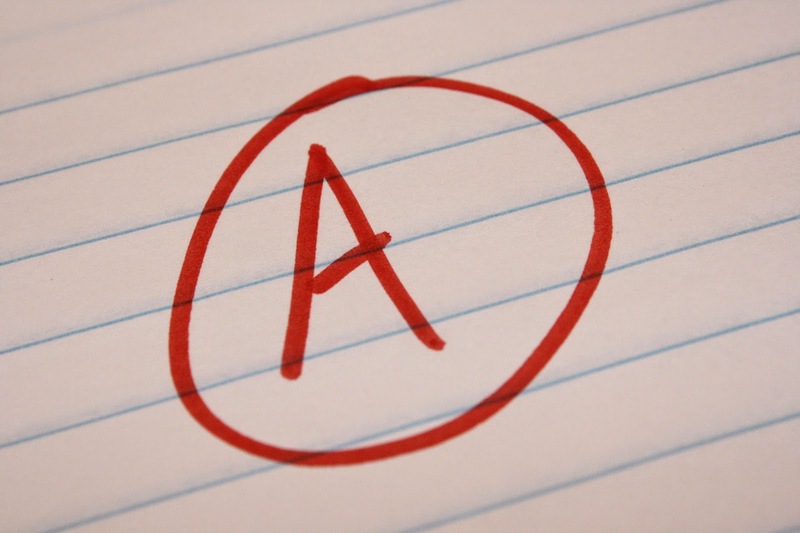 This is the trigger. Pulling it moves the lever arm, which acts as a force multiplier over the short distance required to depress the valve. 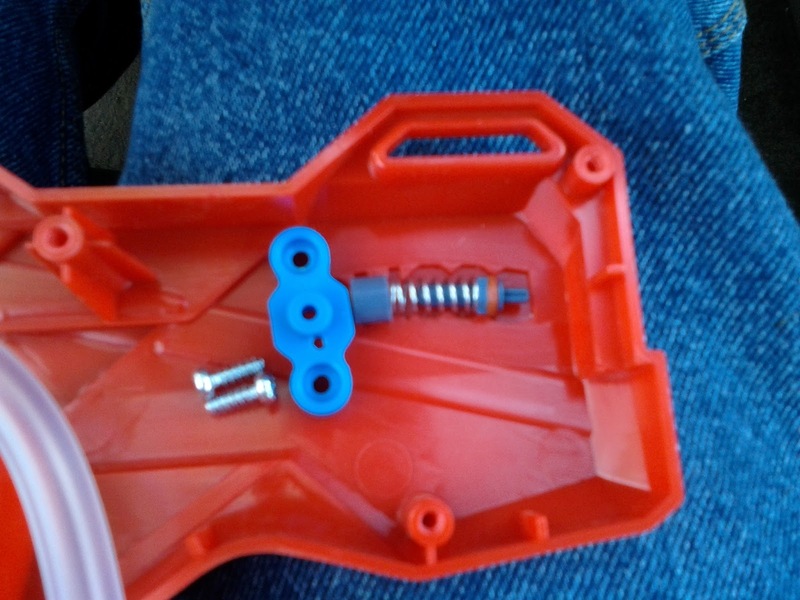 The OPRV on the air tank is secured by a plastic cover and two screws. Nothing special here in terms of function. 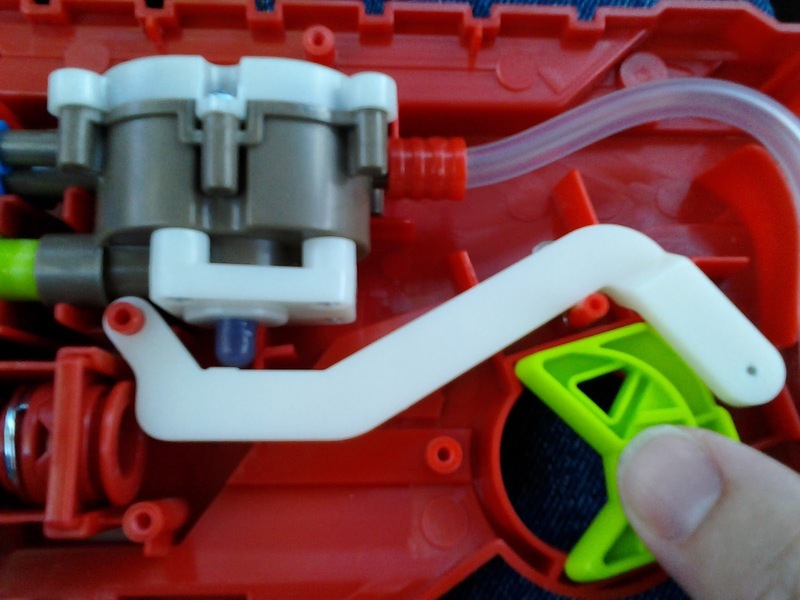 When you remove the bottom cover of the tank, you can see the o-ring/gasket that seals the trigger button. 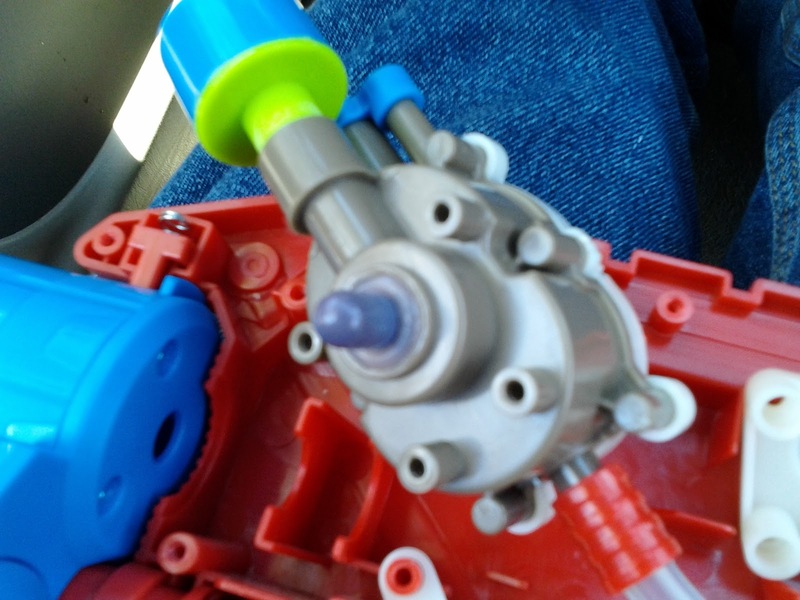 This is still a pin-valve tank, it just turns out you're pushing it from the front, instead of pulling from the back. One interesting note: even with all of the screws around the tank, the plastic is still solvent-welded together. 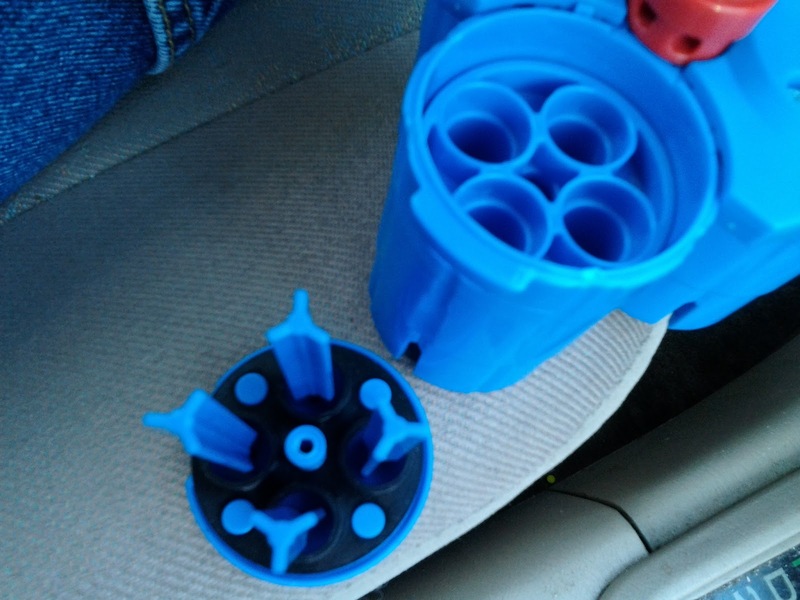 It's made to handle a decent amount of air pressure. 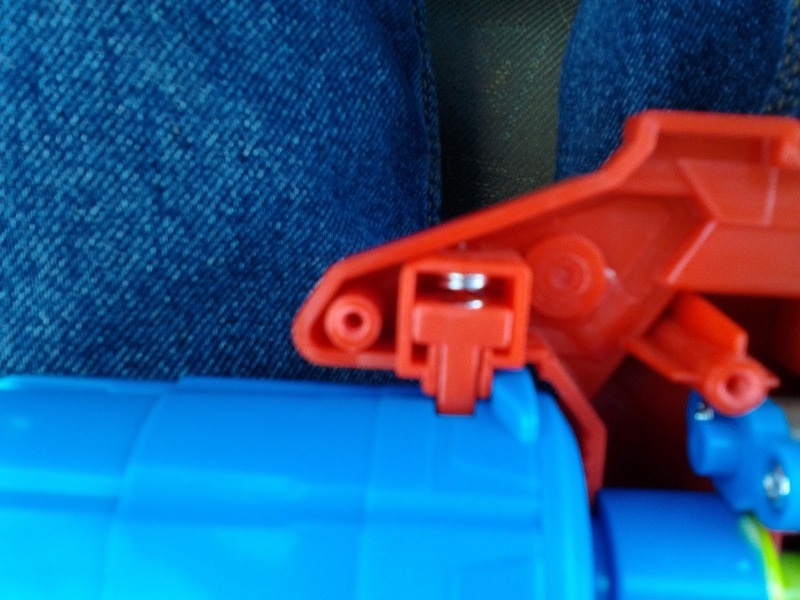 Each shotgun section is composed of a few pieces, with a rubber piece sandwiched between to seal things up nicely. In terms of performance, I was getting the advertised 50' ranges with at least two of the darts each time, if not more. The darts also had a spread of two or three feet in diameter. With a replacement spring in the OPRV, allowing six pumps before it activates, I could get angled ranges of 80'-100'. The spread was around five feet in diameter at that point, The Burstwave does its job well, and would be suitable for both close quarters and for long range targets grouped closely together - you should at least get one of them! Out of interest, I temporarily removed the turret and added a CPVC barrel to the air outlet. With the right dart fit, I was hitting 90' ranges firing parallel to the ground. 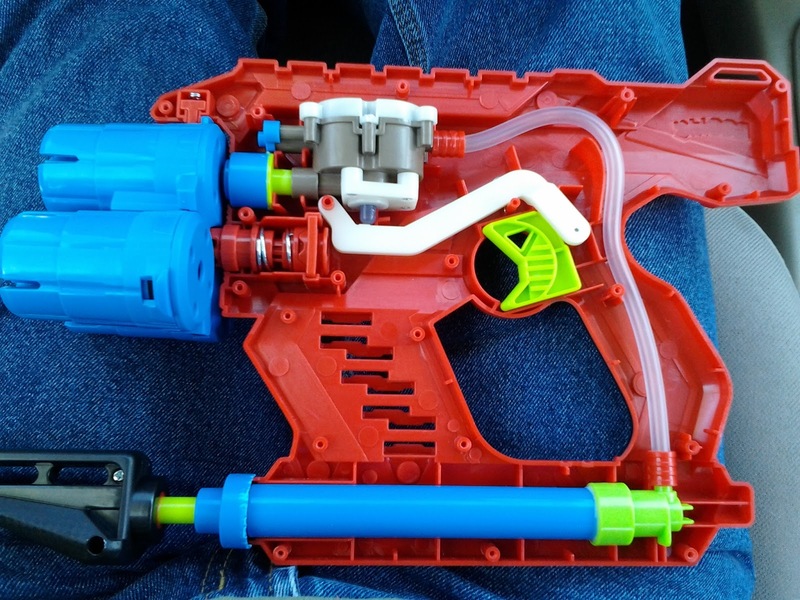 So this blaster may as well be a Supermaxx 1500. I can't wait to see what people do with it.